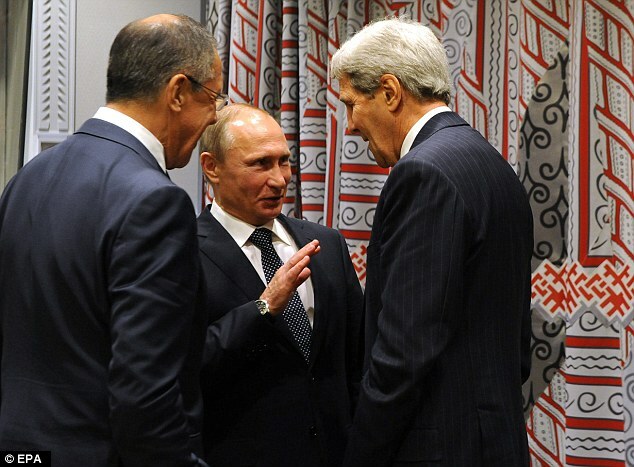 The Russian leader with US Secretary of State, John Kerry.
" Hundreds of millions of people around the world, perhaps including the new Labour leader Jeremy Corbyn, believe that Putin is no less moral, honest and trustworthy than Obama or David Cameroon.. The Russian leader is running rings around the leadership of the west....this is not an idle gambit, It is the first time Russia has launched a major military action outside what you might call the old Soviet empire since the end of the cold war. Many people, both inside and outside Russia, consider the west hypocritical because "we launch drone strikes against our enemies abroad, almost certainly in defiance of international law, invade Iraq and send troops to Afghanistan, then denounce Russia when it plays the same games." Yes, the Russian leader is a thug who-s run rings round Europe and America, But MAX HASTINGS controversially argues that the West can,t beat ISIS without Putin.